Carl Hobbes may have escaped from Camp Twilight--the most secure military prison in the northern hemisphere--but now he's being pursued by a ruthless bounty hunter and an Al-Qaeda assassin. 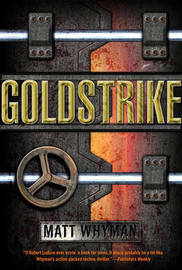 Wanted dead by one and alive by the other, he must call upon his skills as a manipulator of both systems and people to survive. With no second chances available, can he play one enemy against the other in his bid to live another day? 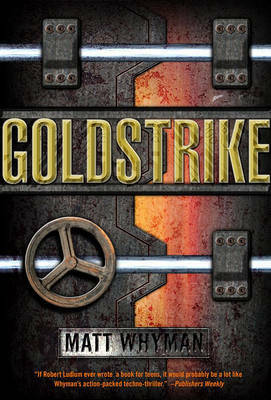 Packed with action and a plot that doesn't quit, Goldstrike is a riveting teen thriller in the vein of Anthony Horowitz and James Patterson. Matt Whyman is a distinctive contemporary voice in children's and adult writing. After graduating from the University of East Anglia's MA in Creative Writing, Matt's career as a writer has taken him from Agony Uncle columns (Bliss magazine and AOL) and teen self-help guides to the cutting edge of both adult and children's fiction. His critically acclaimed young adult novel Boy Kills Man was short-listed for several awards, including the 2004 Teenage Book Prize, and praised by Melvin Burgess: 'Bold, chilling and beautifully written'. It is currently in development as a feature film with the producers of the cult film Kidulthood. Matt is married with four children (and an enormous dog) and lives in West Sussex, England.